This week, we are having a Q&A with our recent guest blogger, Hahrie Han. She is a political scientist at Wellesley College and has a new book out on the topic of how organizations sustain the participation of their members called How Organizations Develop Activists. If you want, put any questions you may have in the comments. Question 1. Can you summarize, for the readers of this blog, your new book’s main argument? How do you prove that? 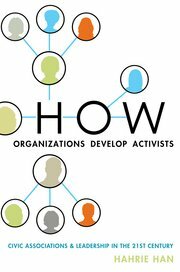 The book begins by asking why some organizations are better than others at getting (and keeping) people involved in activism than others. All over the world, there are myriad organizations, campaigns, and movements trying to get people to do everything from signing petitions to showing up for meetings to participating in protest. Some are better than others. Why? To answer this question, I wanted to look particularly at what the organization does. There are so many factors that affect an organization’s ability to engage activists that the organization itself cannot control. What about the things it can control? Do they matter? So I set up a study of two national organizations working in health and environmental politics that also had state and local chapters operating relatively autonomously. I created matched pairs of these local chapters that were working in the same kinds of communities, and attracted the same kinds of people to the organization. But, they differed in their ability to cultivate activism. By examining differences among organizations in each pair, I could see what the high-engagement organizations did differently. I also ran some field experiments to test the ideas that emerged. I found that the core factor distinguishing the high-engagement organizations was the way they engaged people in activities that transformed their sense of individual and collective agency. Just like any other organization, these organizations wanted to get more people to do more stuff, but they did it in a way that cultivated their motivations, developed their skills, and built their capacity for further activism. Doing so meant that high-engagement organizations used distinct strategies for recruiting, engaging, and supporting volunteers, which I detail in the book. By combining this kind of transformational organizing with a hard-nosed focus on numbers, they were able to build the breadth and depth of activism they wanted. Leadership is one of those words that is used in so many ways that it often means nothing. When I was talking to the volunteers, staff, and activists in my study, I found that they used leadership in a particular way. For them, leadership was defined not by position or authority (as some management scholars might define it), but instead by the willingness to accept responsibility for consequential outcomes, and to achieve those outcomes by engaging others. Imagine, for instance, the difference between being willing to spend two hours calling through a list of phone numbers versus being willing to accept responsibility for turning fifty people out to an event. In the first case, the person is only willing to give a discrete amount of time, and does not accept any responsibility for an actual outcome. “I will come make phone calls for two hours. I may get 20 people who say they will come to the event, or I may get 2.” In the second case, the person accepts responsibility for an actual outcome—getting fifty people to show up—strategizes to achieve that outcome, and puts in whatever time it takes to do so. In addition, for the organizations I was studying, leadership meant doing that kind of work in a way that engaged others. So leaders would not do the work of turning out fifty people themselves, but would try to engage others to help them. Leadership development was thus a crucial factor differentiating the highest-engagement organizations from their low-engagement counterparts. Because the high-engagement organizations sought to cultivate the individual and collective agency of their activists, they essentially were trying to develop their leadership. Han’s findings are reminiscent of Deci and Ryan’s self-determination theory and Amabile’s recent work on task progress. It would be interesting to know if she drew ideas from either of those areas, or if her findings contrasted with prior research in those areas.